regard no one according to the flesh, even though we once regarded Christ according to the flesh, we regard him thus no longer. Holy Cross on 29th March 2016, which we organized in order to respond to the many electoral and human rights issues that were troubling the nation. We further believe that the peace accord brokered in that dialogue meeting should have marked a new beginning. map for a genuine process of dialogue that will be Zambian owned and driven and will be aimed at national reconciliation. As we indicated in our joint statement of 8th January 2018, “true dialogue means a change of heart, attitude and behaviour. expediency that may derail the entire process. 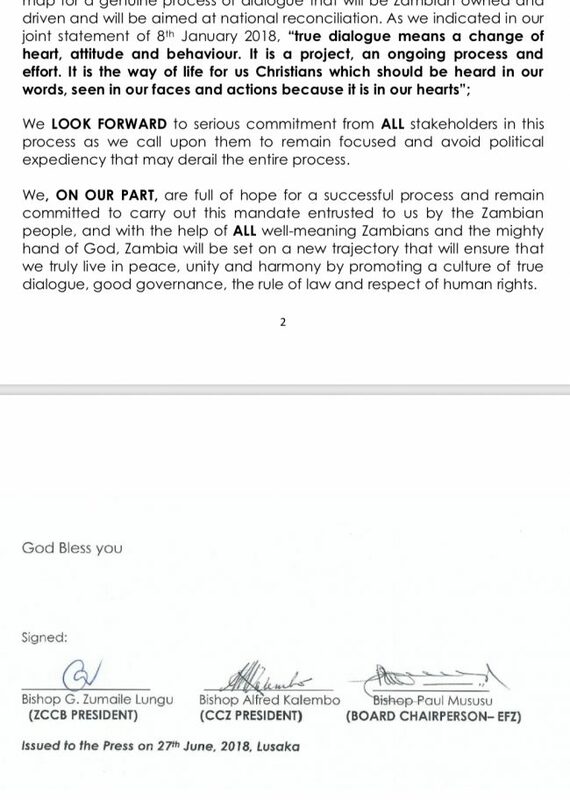 We, ON OUR PART, are full of hope for a successful process and remain committed to carry out this mandate entrusted to us by the Zambian people, and with the help of ALL well-meaning Zambians and the mighty hand of God, Zambia will be set on a new trajectory that will ensure that we truly live in peace, unity and harmony by promoting a culture of true dialogue, good governance, the rule of law and respect of human rights.